Michael H. joined the MT program in August 2017. As a newly promoted Management Assistant, we asked him to share his perspective on competition and cooperation, the mentors who motivate him and how he’s already using his experience to help new employees. What made you decide to join Enterprise? I’m originally from Brooklyn, NY and I did my undergrad at Lee University. A classmate of mine, who was a Management Intern, approached me and said I would be a good fit at Enterprise. I initially didn’t consider it, because I wanted to be a financial advisor. But in conversations with those firms, they told me I needed sales experience first. I decided to join Enterprise to gain sales experience so I could move on. Little did I know how much I would love Enterprise. I graduated in July and by August I was on board with Enterprise. As of last month, I’m a Management Assistant. My next goal is to get an Assistant Branch Manager spot, but a lot of my mentors tell me to take my time in the Management Assistant position. It’s a good time to learn more about the business. There have been so many and I’ve been here less than a year. I am a very competitive person. I was on the tennis team in college. It served me well because it taught me how to be competitive – but I’m learning every day that there’s a time to be competitive and a time to be cooperative. Competition will only get you so far. 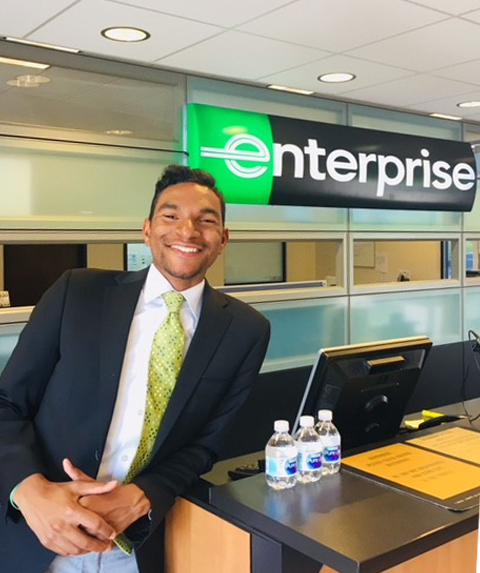 What is your favorite part of working at Enterprise? No branch is the same. Each branch is a petri dish for business operations. Even though you’re an MT, you’re still contributing ideas for how to run the branch. With every customer, you get to try new tactics for sales and customer service and evaluate what works. I’ve helped out at other branches and it’s a different atmosphere at each one. What advice would you give to someone looking to build a successful career at Enterprise? Don’t be afraid to take calculated risks and innovate. We are always trying new things: new ways to show body shops they are appreciated, new ways to help customers. We look at our marketing presence in the area and ask how we can set and measure a goal. Also, get a mentor. That can give you a bird’s-eye view. Your perspective might be skewed and someone else may see something that you’re not seeing. How have you nurtured an entrepreneurial spirit at Enterprise? Once you believe in what you’re doing, it will naturally drive your entrepreneurial spirit. I believe in Enterprise, what we’re doing and the role we play in the community. If I didn’t I wouldn’t be here.